Want to rank ahead of the top search results on Google? Featured snippets have been the buzz in the SEO spaces because of the unique opportunity they offer. This question-and-answer feature in Google offers lower-ranking pages a chance to rank at the top spot. Google’s Featured Snippets are a direct answer to a user’s search query that appear on the top of the search results page. It is a relatively new feature that allows the user to receive their answer to their query without having to visit another website. These featured snipet boxes take the coveted Google position ‘0’ as they come before organic search results. They appear in both browsers and mobile apps, although they don’t appear in a keyword search every time it’s conducted. The content can also vary between Google domains: Google.com and Google.co.uk can produce different featured snippets for the same keyword. There are no guarantees that you can rank for position zero. However, by optimizing your content and your site for the snippet, your answer could be featured. For your content to be read and pulled as a featured snippet, it has to be in the ‘right’ format. 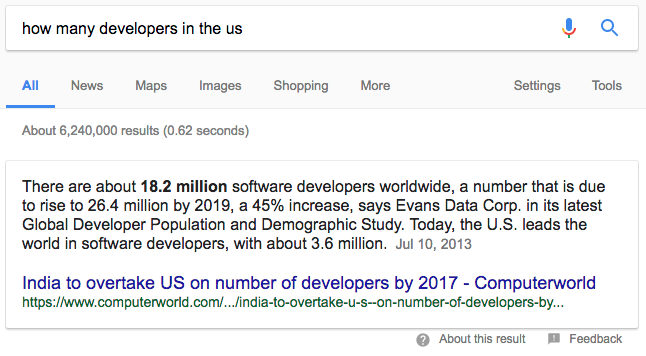 “how many developers are in the US”. Somewhere near the top of your page, you need to clearly repeat the searcher’s question. Semantic relevance to the keyword search is essential. The question must be directly followed by a clear, informative answer. Your answer must be rich and data-driven. Choose an appropriate snippet type, but know that paragraph is the most popular snippet form across all question types. Short means between 40 and 60 words per answer. There is some debate as to the optimal answer length. Moz found the ideal length to be between 40 and 50 words whereas HubSpot research indicates 54 to 58. It must be written in the most logical way that would answer the question. Follow your answer with supplementary information, data, sources, and/or images. The site directly answers the question in a short, informative paragraph, and achieved the snippet spot. Write ‘snippable’ content. Stat research determined 7 types of search queries are most commonly receiving a featured snippet in Google. Targeting a key question type for your field will improve your chances of reaching the featured snippet spot. To ensure your highly-searched question and finely-tuned, informative answer can be pulled as a featured snippet, you need to format content properly. Clear page structure ensures your content is accessible when crawled by Google. prominent on your page, preferably near the top. Images should be tagged with Alt Text that is relevant to the search query. The coveted position ‘0’ increases CTR of the link. HubSpot performed research on high-traffic keywords: they found an average CTR increase of over 114% when the site became a featured snippet (even if those sites were already organically #1). Featured snippets also offer an opportunity for sites with lower domain ranking to be featured on the top of the first page of results. The top-ranking URL does not necessarily, and often does not, provide the snippet content. While the majority of snippets come from links on the first page, Moz research showed that content has been featured from domains as far back as page 71! Depending on the presentation, Google may or may not include the featured snippet source URL. It is especially prominent now in definition searches. However, in the future, featured snippet content may provide Google with the same data without a backlink. No backlink = no click-throughs. The featured snippet may also provide the user with all the information they need, so there is no longer a need to click on the domain. Without featured snippets, the user needs to click through to the source domain to find the information. With featured snippets, this step may not be necessary, depending on the keyword search. Full answer = no click-throughs. Finally, there can be high competition. Unsurprisingly, Wikipedia is the most common site to be featured in the snippets. If you’re looking to have the featured snippet for a keyword currently supplied by Wikipedia, it will be difficult (though not impossible) to beat. Google’s Featured snippets offer an interesting opportunity. For low ranking domains, optimizing content for a snippet offers a shot at position 0 on Google’s first page. However, some sites will lose click-throughs if the snippet entirely answers the user’s question. Featured snippets offer a new, valuable tool to improve Google SEO ranking, but it should be used thoughtfully and selectively.